Melt butter in large sauce pan over medium heat. Add flour and cook, stirring for 1 minute. Whisk in the warm milk and bring to a boil, continue to whisk constantly. The mixture will thicken as the heat increases. Continue to whisk while adding the dry mustard, nutmeg, cayenne, salt and Worcestershire. Stir in the cheddar, Asiago, Bellavitano and stir until it is melted. 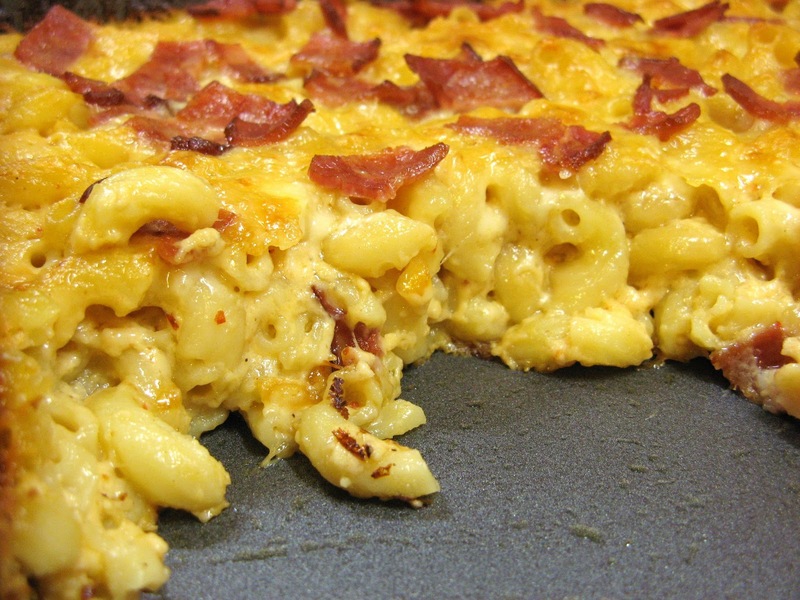 Pour cheese sauce over noodles and add to a 3 quart casserole dish. Sprinkle top with cracker crumbs, Serrano crumbs and Parmigiano crumbles. Bake for 35 minutes. 4 oz. cream cheese, at room temp. Breathe Deep and Smile your family is going to love you! 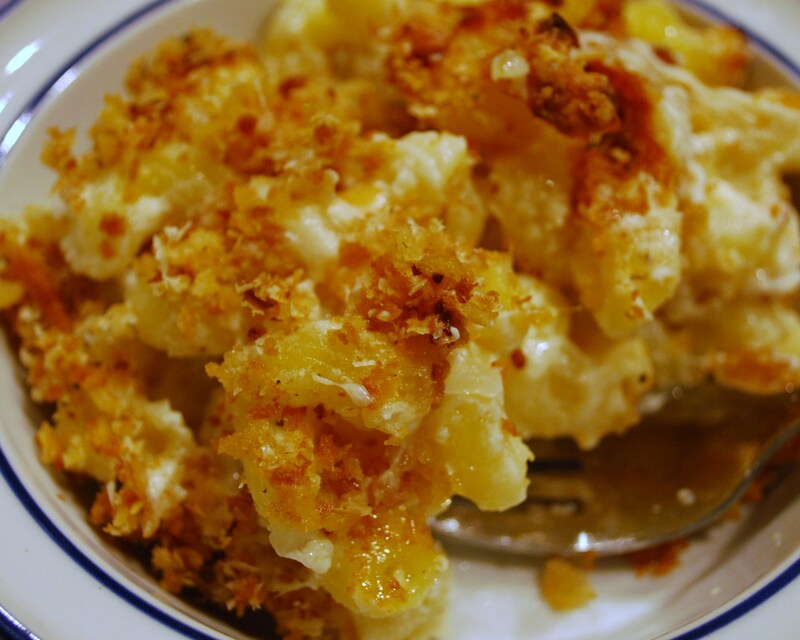 You’re about to prepare the best mac and cheese ever! Grease a 13″ x 9″ nonstick metal baking pan with 1 Tbsp. butter. Preheat oven to 350. Prepare macaroni according to the package directions, but make sure it’s al dente. (It should be firm.) Be sure to add a pinch of salt and a dash of olive oil to the boiling water while cooking. Drain pasta well and pour into the baking pan. In a large mixing bowl, add the heavy cream, half-and-half, and sour cream; break the cream cheese into little bits with your fingers as you add it to the bowl. Add the egg, flour, Worcestershire sauce, garlic and onion powders, dry mustard, cayenne pepper; combine very well with a mixer to break up that cream cheese. It will look lumpy, but that’s okay. Starting at the corners of the pasta dish, place and push down the Velveeta and the Bouche cheddar cubes. Work your way around and toward the middle (they won’t push down completely, but just smooch them down a bit). Sprinkle the Asiago and Bellavitano combo over the mixture and sprinkle the paprika on top. Put this piece of heaven in the oven (make sure your oven rack is right in the middle) and bake until brown and bubbly — approximately 30 minutes. It will be creamy in the center and crustier on the top and edges. Chop some fresh chives and get those taste buds ready. When it’s done, garnish with the chives. Try not to eat part of the crusty top before you serve it, I know it’s hard so Breathe deep and try hard. This is your ticket to a happy family. To change it up a little sprinkle 3 oz. of finely chopped Serrano Ham on the very top just after the Asiago and Bellavitano. Goat cheese is one of my favorite cheeses and I add it to recipes that call for cheese every time I can. This time I wanted a fun appetizer for a BBQ party for a large number of people. Something easy to serve that people could eat with their fingers. Puff pastry mac n’cheese cups and squares. Try them. They are an instant success at any gathering. Oh so good. If you don’t have hours to make your own puff pastry try frozen puff pastry from your local store. Cook pasta al dente. Pre heat oven to 350 degrees. Drain and set aside. Line muffin tins with a 5 x 5 inch square cut puff pastry making sure that corners are over the side of cup. Cut puff pastry into 5 x 5 inch squares. Cut center out of ½ of them and then put cut out on top of full square. Pour cream into a large sauce pan over medium heat. Add the parsley and butter, bring to a simmer. Be careful not to let it boil over. Allow cream to reduce by half. Stir in cheeses and whisk until melted. Stir in pasta and crab meat. Fill muffin cups with a spoonful in center of squares. 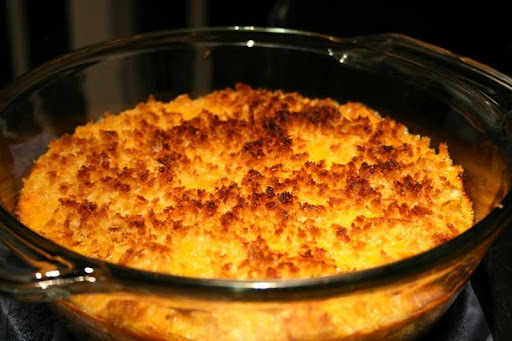 Try my adult version of Mac ‘n Cheese with a nice spicy twist. We use handmade artisan chorizos from our store that are nice and spicy, add an extra hot special blended chipotle powder (also from our store). Then to make this dish melt in your mouth we used an artisan cheddar cheese that has a creamy sharp bite, mixed our milk with heavy cream and added a little Monterey Jack cheese just to round out the flavors. If you like it extra hot try Chef Lippes special blend of dry mustard powder that has the extra kick of wasabi and can be found in our condiments section. Just click on the links to find them in our store and use the code “blog” to receive free shipping. Cook pasta in salted, boiling water until al dente. Drain and set aside. Heat large skillet over medium heat. Add olive oil and sauté chorizo until browned (removed from casing/crumbled). Set aside. Lower heat and melt butter. Add flour, whisking for 1 minute. Slowly whisk in milk and bring to a simmer, continuing to whish constantly. While stirring, add mustard and chipotle pepper, and cheese (save ½ cup for topping). Pour drained pasta into the cheese sauce and toss to combine. Transfer to 3 quart casserole dish. Top with chorizo, reserved cheese and bread crumbs. Bake for 35 minutes or until golden brown and bubbling. If you like this recipe please show your support and like us on Facebook.